A man has been arrested on suspicion of attempted murder after last week’s Hyde Park water fight descended into chaos. 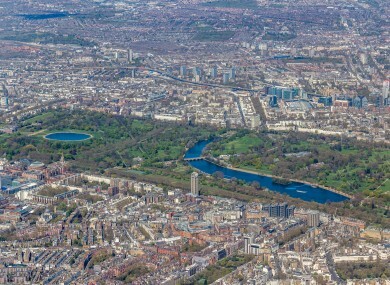 Hyde Park from the air, with the Serpentine to the right. LONDON POLICE HAVE moved to calm public fears of a repeat of the riots that hit the UK capital in 2011. Two police officers were injured and two members of the public were stabbed last week after a water fight in Hyde Park got out of hand. The disturbance prompted fears of a ‘long hot summer’ of unrest in the Daily Express and Daily Mail, which said the arrest were the capital’s largest unrest since the 2011 riots. London is a really vibrant city and is always busy during the summer, when we see lots of extra events hosted in our capital. “Our job is to police those events to prevent crime and disorder and keep our city safe for us all. That is why it is frustrating to read about unfounded speculation that we are concerned our Capital will see a summer of disorder. A man was arrested on suspicion of attempted murder yesterday after a triple stabbing during the Hyde Park disorder, which saw up to 4,000 people gather for a water fight. The 18-year-old man was arrested earlier and remains in custody, the BBC reported. A second police officer suffered injuries from a flying bottle as officers tried to contain aggressive crowds that had gathered on Tuesday 19 July, when temperatures reached 33C on the hottest day of the year. Eleven people in total have now been arrested after the Met released a gallery of photos of suspects linked to the disorder – although they have removed the picture of the man arrested for attempted murder. The Met urged people to “think really carefully” about the types of event people attend. What we do do though, and continue to do, is respond quickly and effectively to any incidents that take place, and that includes the disorder we saw last week. “Our response made sure that the incidents were quickly stopped and we are now arresting those people who attacked each other and then turned their violence towards us. “Yes, this summer will be busy, but so is every year,” the statement added. Email “London police read press the riot act over 'summer of disorder' speculation”. Feedback on “London police read press the riot act over 'summer of disorder' speculation”.